Swimming is a popular activity for kids, especially in the summertime! Last week we featured a NEW vocabulary lesson called Swimming, which focuses on the actions that kids need to know when learning to swim or playing in the pool. It also includes the names of different swimming strokes. This week we’re featuring our NEW vocabulary lesson called Swimming Pool, which focuses on the objects kids will see at the pool such as lifeguard, slide, diving board, shallow end, etc. Swimming Pool includes a picture dictionary, matchup, word choice, word search, word scramble, and spelling bee. There are also discussion questions so that your students can practice using the new vocabulary in context. 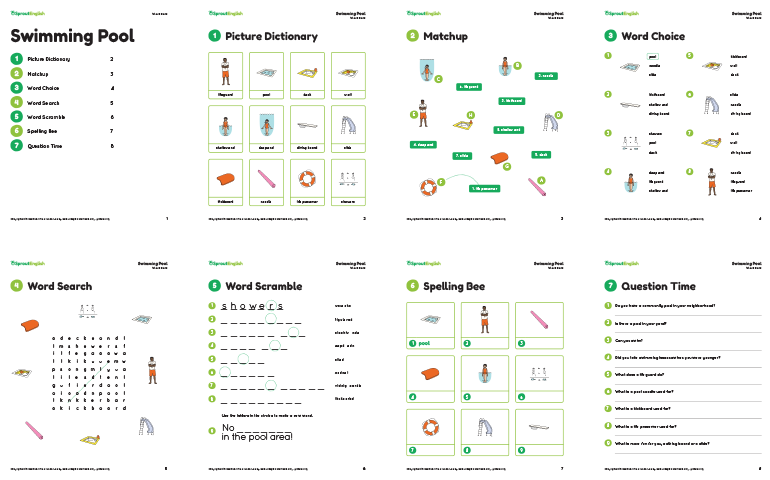 You’ll also find a set of flashcards at the end of this lesson that you can use for preview or review. Try 9 Ways to Use Cards & Flashcards in Class for activity ideas. Find this lesson in the Word Bank – Sports & Leisure.